Choose Your Week Blocks Below! Summer special $40 per class! Pricing Includes snacks and in class materials used, plus access to the QTalk online games for the length of your session. ​10% discount for 3 or more blocks. Choose your blocks below. Enroll Now! Space is extremely limited. 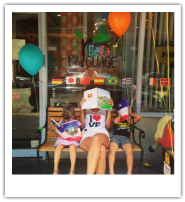 Bilingual Summer at Tribeca Language ! Welcome to a world of language and exploratory fun! The Summer Camp Alternative classes at Tribeca Language are small in terms of size, but big in terms of quality interaction and personalized attention. 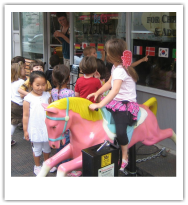 The program is a fascinating and dynamic mix of visually captivating language lessons from our QTalk curriculum and fun practice through games, puzzles, puppet play, arts & crafts, music & theater projects, as well as vi﻿sits to the local Washington Market Park using imagination & creativity. All in the target language! With the QTalk method founded by Maurice Hazan, your child will systematically move through a 3-phase learning progression: Phase 1: Comprehension, Phase 2: Recall, & Phase 3: Spontaneous Language Production. 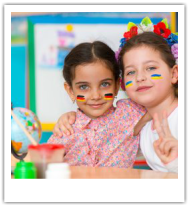 But all the while as they are immersed in the target language, they will be continuously engaged in a variety of interactive, play-based, age-appropriate activities. Our enthusiastic, native-speaking teachers introduce the children to the new language and vocabulary through a high-energy mix of games and projects that have been designed to promote learning and fun! In addition, we accept 8 children per class (max), so you can be assured that your child is getting the attention he or she needs to learn effectively. Please note: Activities will vary from day to day. ﻿Examples include﻿: children creating dialogues for scenes and then acting them out; creating fun costume pieces and masks and performing in front of the class; and themed art projects ranging from nature to vacation to replicating certain art masters' famous works! Waiting Lists: Once a specific class date fills, we will begin a waiting list. If and when there should be a cancellation, we will contact parents on the waiting list. We recommend enrolling early to ensure your dates are available. Announcements: Summer Camp 2016 Registration remains open and there are still seats available in all sessions. As soon as a session fills it will be marked "full" on this website. Don't delay your registration - limited availability as seats fill up quickly! EARLY BIRD SPECIAL - SIGN UP BY MAY 1ST & SAVE $50! !